Sekinchan is an interesting little town in the north western corner of Selangor state called Sabak Bernam, about 100km from Kuala Lumpur. The flat plains along this coastline are well suited for agriculture and the town is the centre of a rice paddy production area. 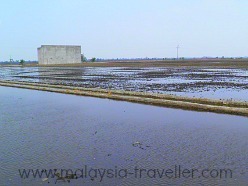 Paddy fields stretch for miles and continue up to the Bernam River which marks the border between Selangor and Perak. These fields are intensively farmed and are divided into neat rectangles bordered with drainage ditches and low concrete walls to allow the fields to be flooded for planting season. The farmers grow two rice crops per year and the colour of the scenery changes from muddy brown to vivid green to golden yellow and back to brown as the growing cycle progresses. During my visit (August 2013) the fields were being flooded. I would like to go back when they change to bright green. 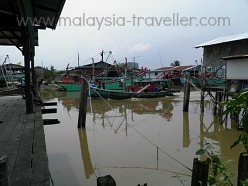 There is a busy fishing community of mostly Teow Chew Chinese in an area called Bagan on the banks of a sheltered inlet. Numerous fishing boats were seen returning to harbour in the early afternoon to unload their catch. They still build wooden fishing boats in the traditional way here. Nearby is a small beach called Redang. It is rather untidy but some local families were enjoying themselves with picnics under the trees. You can walk along the coast here which appears to have been artificially lined with rocks to prevent coastal erosion. You might spot some migratory birds here and find some nice seashells on the rocks. 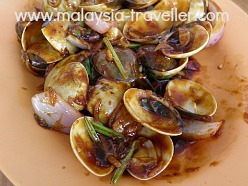 Most visitors to Sekinchan probably come for the food and, as a fishing village, there are plenty of good seafood restaurants to choose from. 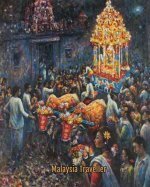 The town is based around 3 cores known, rather unimaginatively, as Site A, Site B and Site C.
These sites, which would once have been fenced and guarded, were set up during the Malayan Emergency as a means of preventing Communist Terrorists from accessing the local population for food, medicines or support. Today, Sites B and C have more or less merged into one town, while Site A is located a few kilometres inland across the paddy fields. 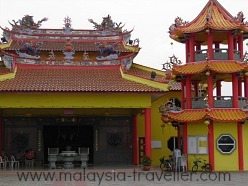 At Site A, which is a farming community of around 200 homes, there is a large temple called Nan Tian Temple overlooking the paddy fields. There is also a mango farm here and, in season, stalls selling mangos together with ciku, jambu air and sweet corn, can be seen lining the main road into town. 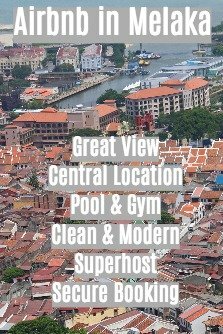 If you want to stay longer in this area there are a few small hotels and homestays in town or, for accommodation nearby, you can see what is available on Agoda's website here. 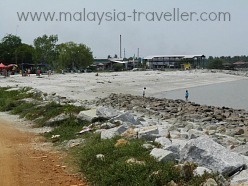 I have marked the location of the town on the interactive map on my Top Selangor Attractions page. 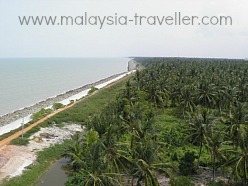 Take the E25 Kuala Lumpur to Kuala Selangor (LATAR) Expressway. From Kuala Selangor continue on Highway 5 through Tanjong Karang to Sekinchan.